The news hasn't let up today now that the XSEED forums have been on the case. Trails of Cold Steel is yet another domain registration that has popped up originally a few months ago. 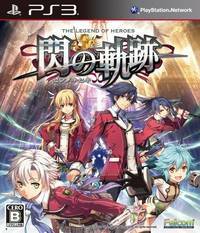 While this name does not closely resemble other titles the publisher has brought over, but if we consider the whole "Trails" name, we're looking at something more along the lines of Sen no Kiseki which was released for the Playstation Vita and Playstation 3 in 2013 from Nihon Falcom. If we go off of its (very unfortunate) almost literal translation of the title with "Trails in the Flash" (never call it this), you get the "Cold Steel" comparison. I guess this would also satiate my appetite considering how ads for that title kept appearing in Akiba's Trip, making me yearn to play it.